A Ritaj unit ... sporting an Islamic theme. 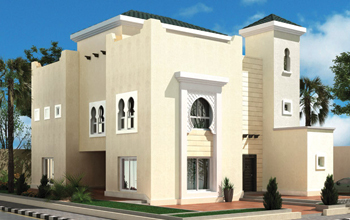 THE first phase of Ritaj Residential Project, being developed jointly by Blominvest Saudi Arabia and Maskan Arabia Real Estate Development Company in Riyadh, is nearing completion and now being delivered to the owners. Spread across an area of 1.14 million sq ft at Al Yasmeen district in northern Riyadh, Ritaj Residential Project comprises 292 residential units, said Abdullah Al Rashoud, CEO of Blominvest Saudi Arabia. “The units come in diverse elegant themes and in various sizes and areas to perfectly suit different segments of the Saudi society,” he explained. The project was based on the construction of 30 models distributed over three phases with the models designed to convey Islamic themes. Al Rashoud said a total of 100 units will be built in the second and third phases, which are set for delivery by the end of the first quarter of this year. He underscored that the Ritaj project complies with the highest international quality standards where only the best materials are used in the construction and finishing works. The owners of Ritaj villas will be granted a 10-year guarantee on the construction works and a two-year guarantee on the insulation, plumbing and electricity works, said Al Rashoud.